Sadly, a new Chrono Trigger game may never be made, but at least Square is giving us something. 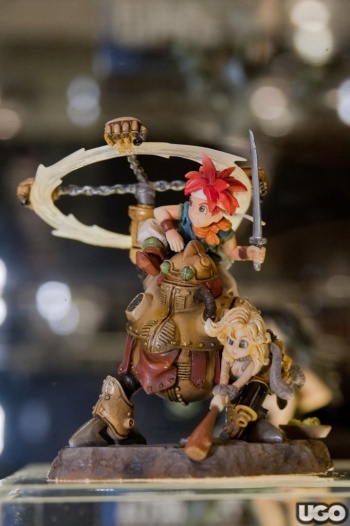 One only has to look at my avatar to know of my love for classic SNES RPG Chrono Trigger, which is why I was so surprised by the reveal of some incredible new Chrono Trigger collectibles at Toy Fair 2010 this week. These aren't just figurines in the shape of the characters from the greatest RPG of all time, but depictions of battle scenes and private moments. Chrono Trigger is a Square RPG that is universally beloved by everybody. That's right, nobody in the world hates Chrono Trigger, not even one little bit. Though it was originally released for the SNES, it later hit the PlayStation and was most recently ported to the Nintendo DS. Chrono Trigger's battle system works in such a way that the three character party can join together to perform a very powerful move, called a triple-tech. Double-techs are also possible, though not normally as powerful. Every tech has a different power level and graphical effect. In the one statue, it looks like characters Crono, Robo, and Ayla are getting ready to do their triple-tech, which is awesome. Another statue shows girl genius Lucca fixing Robo, the game's strangely emotional robot. Crono and Frog are depicted in the third, while Magus hovers above an attacking Crono in the fourth. Only four statues were shown off in total, but they look incredibly detailed and represent Akira Toriyama's character designs well. The collectibles might help me to forgive Square Enix for sending cease-and-desist letters to all groups developing popular Chrono Trigger fan-made projects, such as a planned full 3D remake, and an expansive ROM-hack. Still, Square Enix has given no indication that it plans to create any more Chrono Trigger games, as the DS port may not have met sales expectations. Maybe if enough people buy the statues, Square Enix will reconsider? They'll be available in August, so get out there and buy them! A full gallery of all four statues is available over at UGO.